distance between the sodium lines. It is impossible to indicate exactly the width of the line, because the distribution of intensity throughout it is not uniform. The important point to which I wish to call attention, however, is that this curve is of such a simple character that for a difference of path of over 200 millimeters, or 400,000 light waves, we can obtain interference fringes. This indicates that the waves from this source are almost perfectly homogeneous. It is therefore possible to use these light waves as a standard of length, as will be shown in a subsequent lecture. The curve corresponds to the red radiation from cadmium vapor in a vacuum tube. In using this red cadmium wave as a standard of length it is very important to have other radiations by which we can check our observations. The cadmium has two other lines, which serve as a control or check to the result obtained by the first. extends almost to 200 millimeters. The corresponding line is shown to be a close double. 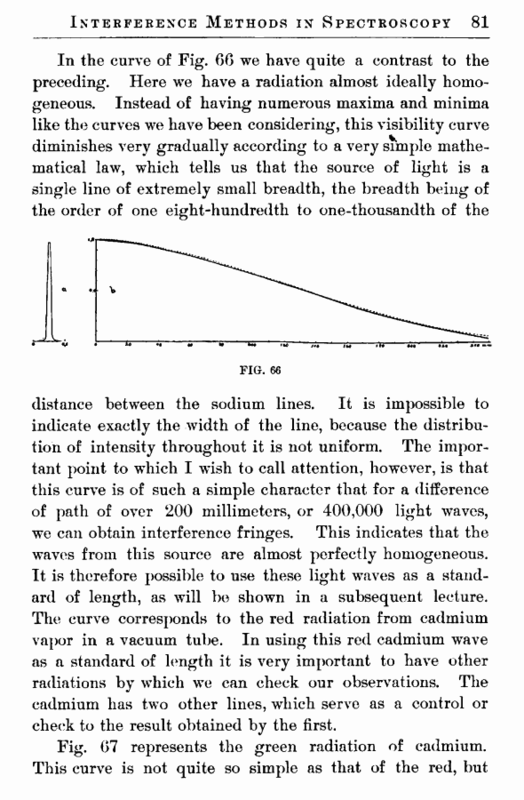 The curve corresponding to the violet light of cadmium is shown in Fig. 68, and is seen to be comparatively simple. 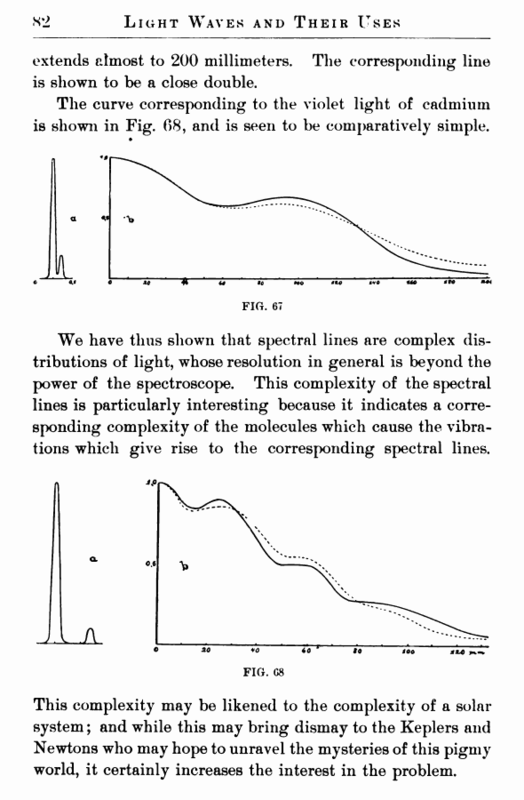 We have thus shown that spectral lines are complex distributions of light, whose resolution in general is beyond the power of the spectroscope. This complexity of the spectral lines is particularly interesting because it indicates a corresponding complexity of the molecules which cause the vibrations which give rise to the corresponding spectral lines. This complexity may be likened to the complexity of a solar system; and while this may bring dismay to the Keplers and Newtons who may hope to unravel the mysteries of this pigmy world, it certainly increases the interest in the problem.